This week's Frugal Fridays question was: What wonderful creations have you and your family made out of cardboard boxes? Whenever I look at a cardboard box, I always want to keep it. I think, “It can be useful for something. Let’s just hold on to it just in case.” Very earth-friendly but not at all practical! But in this case, I’m glad I made some use of the cardboard boxes these chocolate chip cookies came in. 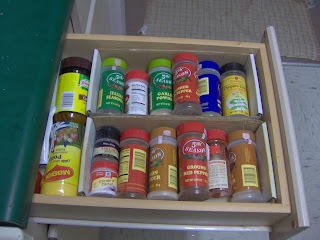 I don’t even remember if they were good cookies or not but I do know they make for an organized spice drawer. Every Wednesday I plan to post the best deals for Barnes (B), Winn-Dixie (WD), Publix (PUB) and Food World (FW). Then I will post a grocery list for price-matching these sale items at Wal-Mart. Why run 3 errands when you can buy it all at Wal-Mart? However, Wal-Mart does not price match BOGO items, or anything that is a % off sale. The actual dollar amount price must be printed in the sales ad. 1. Have a copy of this list. 3. Put these items in the back, keep them together. 5. She should have a copy of the ad and may or may not look through it first. 6. Check your receipt to make sure the prices are right. 7. Thank the cashier for her patience when you're done! Please check the weekly ads here to see what products to purchase that you may have coupons for. Publix can be pricey but they have a page in the weekly ad called Affording the Essentials for inexpensive staples. Also, watch out for frequent sales in their natural and organic section. This week has lots of great BOGO items. You can find the complete list on the left side bar of the Publix website. BOGO means Buy One Get One Free. If you clip coupons, you can use one coupon for each item, even if one will be free. They will charge you the price for 2 even if you only buy 1 so be sure to grab your free item. Do you get WIC? If the item on your WIC Check goes on sale for BOGO, you can also get it BOGO. I always hold off using my WIC Check with the cereal listed on it so I can double up my cereal. This week get double cereal and peanut butter! 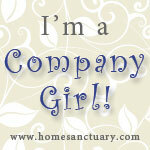 Please check the weekly ads here to see what products to purchase that you may have coupons for. Food World can be pricey so I try to shop only for sales. Remember that Wal-Mart will price match Food World's sale price so you can get these there instead. Saturday April 25 only, up to $0.55! = $0.50 each after coupon! = $0.17 each after coupon! I'm so glad to finally have a place to talk and share about what I do best... grocery shopping! 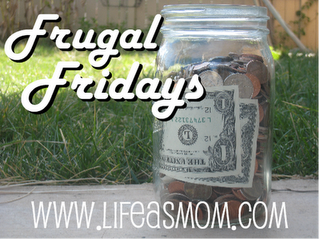 My goal is to share simple tips to help you in your own frugal adventure. There are lots and lots of great deals out there. Sometimes it can be confusing and frustrating to figure out where to even start. So, instead of trying to get every possible deal, I'll post about ones easy to get and have a higher savings impact.